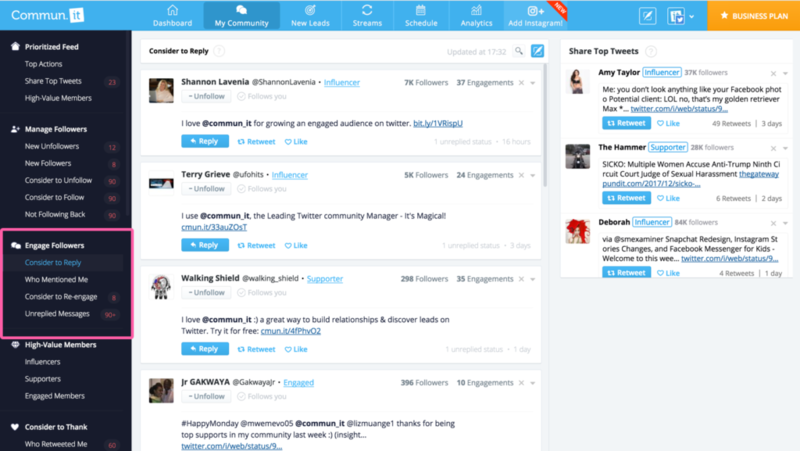 Commun.it’s Social Dashboard is the one tool you need to grow your social community. 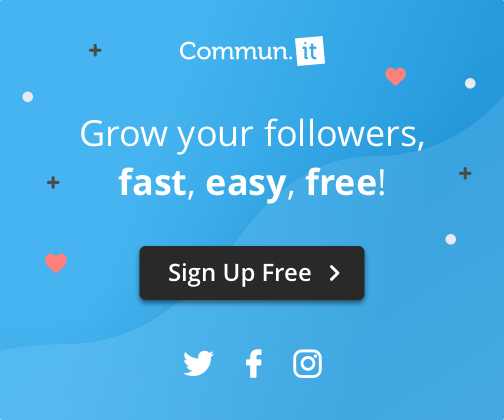 From day one, you’ll be able to save time, learn more about your followers, and gain intelligent insights to be smarter in managing and growing your audience. Everywhere you click in the dashboard, there’s a new insight or suggestion to overturn. In order to harness all this, it’s important to get to know the Commun.it tabs. Take a look at this short video that helps you navigate your new marketing dashboard. Now that you know your way around, take a look at our top 5 tips to grow your audience on Twitter, Facebook and Instagram. Posting quality content is a great way to keep your followers interested and coming back to your page. It’s important to stay updated on recent current events and share articles about the topics that interest your community. As part of the Share Top Content campaign, just choose few topics and Commun.it will share 2-5 articles per day for you, that your followers will love. 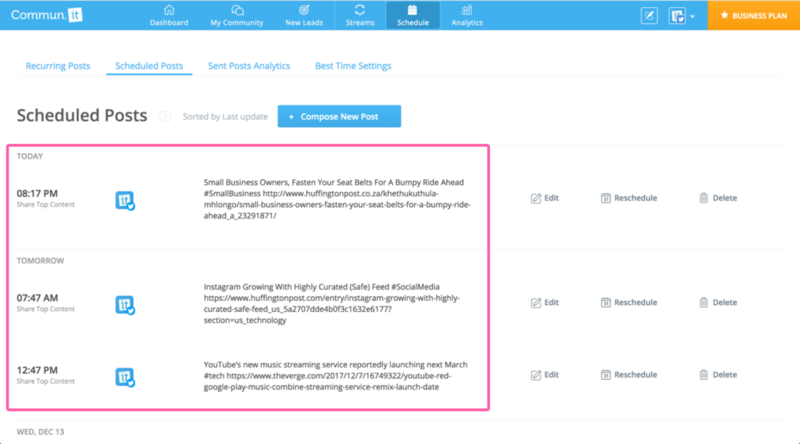 How to use it: Activate the Share Top Content campaign in the Settings page of your dashboard, and watch your scheduled posts fill up. Every single day, you should thank your recently engaged people in your community. This could be someone who Retweeted you, for example, or an influencer in your community you haven’t spoken with in awhile. Use the #HappyMonday widgets and #ShareTheLove widgets to tweet at your community members each and every day. 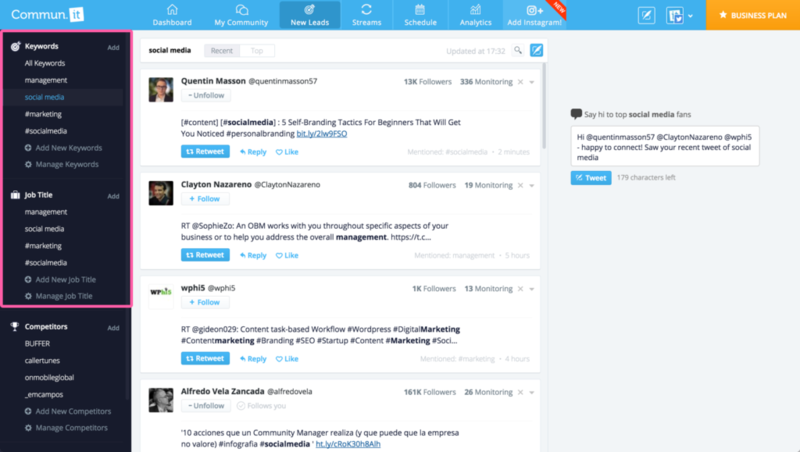 Commun.it analyzes your community and suggests new Influencers, Engaged members, New Followers or Supporters for you to engage with. This will keep people connected with you, and also help you get more exposure with your followers and their followers. How to use it: Log in on Monday, Wednesday and Friday to see the widgets and helpers for easy engaging with your community. Staying updated on what’s going on in your community is crucial. It’s important to respond to Direct messages, tweets, retweets and replies you receive! This helps build relationships with people inside and outside your community. Your goal is to turn every person who retweets your posts into a follower, and reply to notifications is super important for doing that. Commun.it also identifies positive and negative mentions of you or your business, so that you can quickly respond or share these feedbacks from your community. How to use it: The Community tab of the dashboard gives you an in-depth look at all the notifications you’ve received, split up by categories. Discover new people who are interested in the topics you care about, every day! The Leads tab is home to new suggestions of people to follow and engage with, all you have to do is choose the keywords you care about. You can then see daily suggestions of people to follow per each keyword. A follow goes a long way – people will receive your notification and hopefully check out your page, and follow you back. 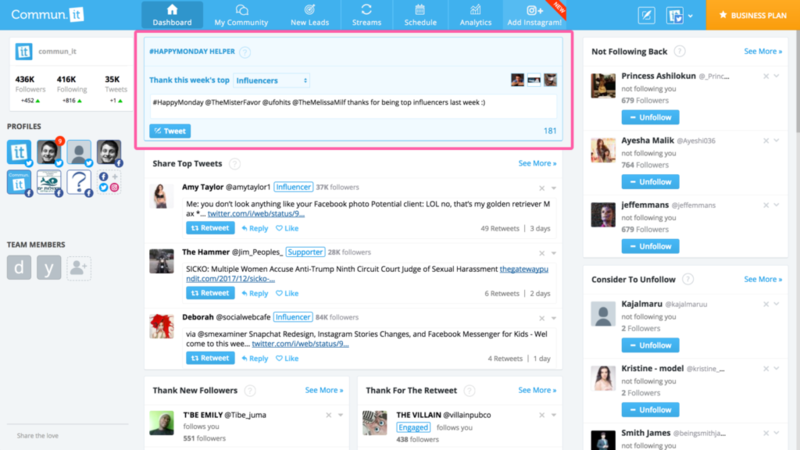 How to use it: The leads tab of the dashboard is home to tens of daily suggestions for you to follow and like. To save time and maximize your effectiveness on social, it’s best to spread out your planned social posts over a few days at a time. Instead of having all your replies, comments, retweets, and new posts sent out instantly, send them all at the ‘Best Time’, and they’ll be spread out over a few days. This way, your effort today will last few days at a time. If you post everything today, you’re limited by the number of people who will see your posts. You want to create a lasting impression, and this feature helps you do that. 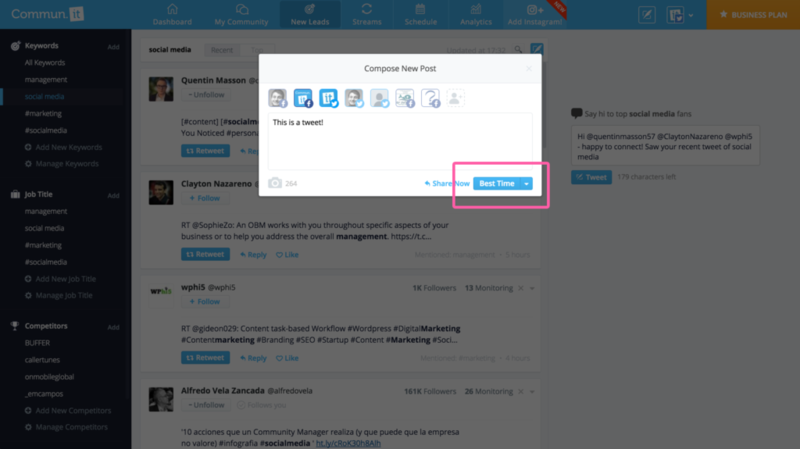 How to use it: When sending new posts, click Best Time to have Commun.it choose the optimal time for you to post. Edit these Best Time settings in the Schedule tab. Today is the day to start investing in your community. We hope these features save you time and help you grow your social community, so you can focus on creating a meaningful business. A little change today can go a long way. What you do today, can improve all your tomorrows. We’d love to know: What are your favorite time-saving features in Commun.it? Tell us in the comments below!